Let’s get this straight. I don’t consider myself a runner. I am a woman who became a mommy and didn’t have the time or money to go to a gym with a newborn to take care of. So I made it my goal to get back in shape with a few DVDs (those postnatal workouts with cheesy trainers telling you you’ll be as fit as ever) and a light jog every now and then. No matter where you run in Jerusalem you are bound to face a hill, so I figured a good twenty minute run was plenty and would keep me healthy. But once I started running I realized I could do the twenty minutes and maybe just a few minutes more. My husband and baby and dog also began to join me for the run. Now it became healthy time and family time as we ran up and down the hills together. When we found out the first-ever Jerusalem Marathon would be in March, we decided this would be the perfect goal for our running challenge. The Half-marathon, that is. Let’s not get too crazy here. Every week we planned a new route on Gmaps Pedometer and added a kilometer or two to our run. Every week I thought it would be impossible for me to run that long or up that many hills, but I always did it. I wanted to. I needed to. I had to. After every run I would say, “that’s the longest run I ever did,” because it was. And it felt exhilarating. That said, I still feared the big day and running 21.1 kilometers. The week before the marathon I was pumped. That, and I was stuffed on Purim sweets and too much of a little of everything. As I prepared physically and mentally for the big day, I saw the city also getting ready with posters, flags and turning Gan Sachr into a huge finish line and party zone. I was getting that tingly feeling in my stomach (along with my perpetual stomachache from Purim treats throughout the week). Then two days before the race there was a terrorist attack— a bombing just in front of the Binyaeni Hauma Conference Center at a bus stop. Dozens were injured and British woman was killed. There hadn’t been a bombing like that in years, so needless to say the city and her people were in shock. The conference center was actually where runners were supposed to sign up for the race, so now I wondered if it was even possible to go there and if the race would happen. By Thursday the city was slowly getting back on her feet and recovering from the attack. Jerusalemites refused to let the bombing affect their daily life routine, this of course being exactly what terrorists want us to do, and so business ran as usual. My worries about any cancellation of the marathon had ceased and now I looked forward to the big night before the big day, with a huge pasta party being held at the conference center for all the runners. But then there was really bad weather. I mean it normally doesn’t rain in March here, and now we were getting hail and flooding in the streets. It seemed like the first marathon just wasn’t going to happen or at least wasn’t going to be fun. However, you should never underestimate the power of a holy city. By Friday morning the rain was put on pause and the weather was the perfect setting of cold air a runner needs to keep a good heart rate and not get heat stroke (I say pause because it did in fact rain later that day after the race…holy city people). With my pasta-full belly, number card placed on my shirt, dirty Red Sox hat, husband by my side and baby in the stroller, we were finally ready to take on the streets of Jerusalem with thousands of other runners. Would I make it to the finish line? Would I take breaks or would I have a break down? My anticipation was met with a gun shot, but not the terrorist kind, just the one bullet to initiate the race. And we were off! As I ran with the crowd all my worries about bombings, weather and self-doubt disappeared. I was in the moment, a very long moment, but an incredible one. And yes, my baby cried for the first seven kilometers, but we all made it past the finish line with smiles on our faces. The energy of the other runners and the cheers of people on the sidelines was all I needed to get by (that and water and some stuff called gu which has some crazy amount of caffeine and vitamins to give your body a big boost). The Finish Line is a Beautiful Thing! So like I said, if you have never run the race, then lace up and make it your challenge for next year, March 16, 2012 because you have a date with Jerusalem. Running is a free sport that can be done on your own or with the family whenever you have the time. True, you need to make the time, but once you do, you will see that you could never live without it. 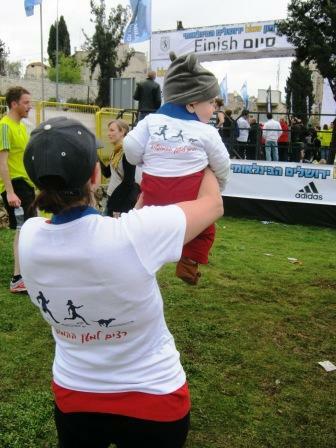 In fact after my experience I would like to start a mommy running group here in Jerusalem. I am happy to help train mothers who would like to run in general, run a race or just stay healthy. So, if you are interested please email me to get started and together we will get to that finish line! 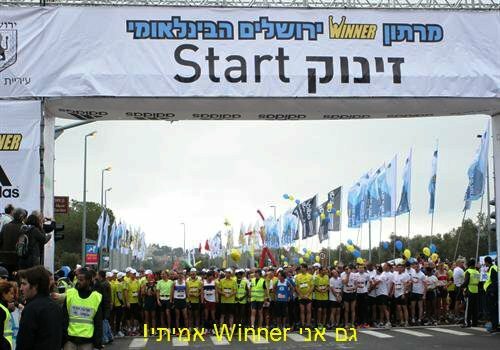 Enjoyed Jerusalem Marathon, Amazing, When It’ll be on 2012? "The Jerusalem Marathon and You! (Next Year in Jerusalem Indeed!)" 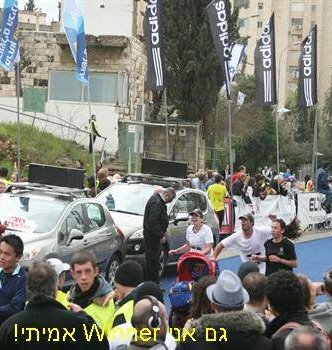 was written March 27th, 2011	by thebigfelafel, and filed under Jerusalem Scene, Travel Israel and tagged challenge, half-marathon, health, Israel, jerusalem, Jerusalem marathon, marathon, Posts by Molly, run, running.